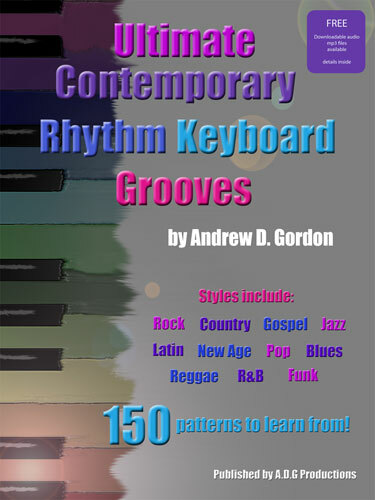 Ultimate Contemporary Rhythm Keyboard Grooves will give you an insight into how keyboardists play rhythm keyboard grooves in many different styles of contemporary music such as: Pop, Rock, Blues, Jazz, Funk, R&B, Latin, Gospel, New Age, Reggae, Calypso. Each of the 21 grooves is broken down into patterns ranging from 3 up to 16 with over 150 patterns in total. Each groove uses a chord progression that is commonly used for that style of music and generally starts off with a simplified pattern and as you progress through the groove, the patterns become more complex both rhythmically and harmonically. The CD that accompanies this book contains all the patterns that are notated in the book. Each pattern is recorded twice, 1st. with the keyboard rhythm part playing along with a rhythm section of organ, guitar, bass and drums and in certain grooves percussion, 2nd. the rhythm section without the piano rhythm part, so you can practice along. Also, there are extended 2-3 minute play-a-long mp3 files of all 21 grooves contained on the CD that can be accessed from a computer enabling you to practice each groove and pattern for an extended period of time. The play-a-long mp3 files gives you the ability to either practice the rhythm patterns notated in the book in whatever order you prefer as well as the possibility of creating your own rhythm patterns. MIDI files are also included on the CD.